He's the size of a dog -- but he's not a dog. He's got hooves like a pig, but claws like a wolf. He smiles. He listens to commands and stories. And he eats plastic. ONLY plastic. Water bottles, jug lids, shopping bags. 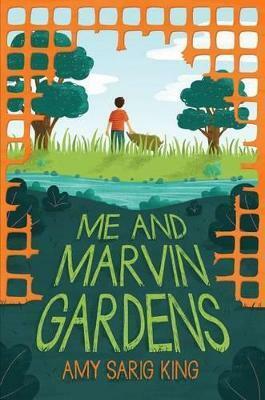 Marvin is an entirely new kind of animal, and only Obe knows about him. To keep him safe, Obe will have to face an enemy, take some risks, be fearless, daring, and brave -- and tell some secrets that have been a long time coming. In her most personal novel yet, award-winning author Amy Sarig King reveals a boy-meets-animal story unlike any other, about a friendship that could actually save the world, and a kid finding the courage to share it. The track was part hoof and part paw. It was part dog and part pig. It made no sense, this track. I looked for others and when there were no others, I figured someone must have been playing a joke on me. The noise made the hair on my arms and legs stand straight up. I thought it was Tommy and his friends because I didn't believe stories about ghosts -- not even the one about spirits who were angry at the developers for growing houses instead of crops. But it wasn't Tommy.